Like every year the Traditional Handicrafts Festival provides the opportunity for its visitors to get a glimpse of the heritage of the ancestors and learn how they were able to adapt to the available resources and utilize them efficiently and brilliantly to cater for their needs. 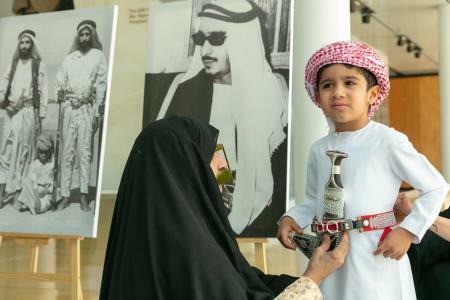 Beside its role in inspiring people and taking them on a journey to the past, the festival highlights the importance of handicraft products in the UAE's heritage. Moreover, the Festival calls upon the people to help develop and maintain handicrafts and support the craftsmen/women to ensure the survival of this art. The festival features performances by folk art bands, attend musical evenings and heritage and cultural programmes and live performances and demonstrations by the craftsmen/women. The UAE is rich with a variety of original folk arts that represent a major part of the popular heritage in the country. The diversity of these folk arts reflect the cultural and social diversity of the people and society. Such form of art is closely linked to the society’s traditions and customs, as well as the social gatherings, celebrations and events. Coffee is a symbol of generosity in Arabic culture and it is present in all Arab houses, mostly seen during evening gatherings and is used to welcome guests. Coffee has been a subject in poetry, stories and tales and is seen as a purifying and healing drink for the soul and body. There is so much culture and heritage embodied through this famous drink and it is closely associated with the life of Bedouins and their customs and traditions. 1- The participant must submit a copy of his/her personal identification papers. 2- Participants must adhere to the arbitration committee's instructions and the contest's conditions. 3- The participant must demonstrate how to prepare coffee in front of the arbitration committee. 4- The participant must finish preparing the coffee within the specified timeframe. The first three winners in each group will receive valuable prizes. Over the course of history, the Emirati popular food has been unique and different, and the way it is prepared is heavily influenced by traditions. Our ancestors passed down their experience and skills in preparing Emirati traditional food to the next generations which helped preserve it over the years. This also helped it maintain its status as a symbol of Arab generosity and true heritage identity. The contest features ten traditional meals that are still present in the Emirati kitchen to this day. 1- The meal must be prepared by the participants only. 2- The participant must be 15 years of age or older. 3- Participants must present their meals inside a medium-sized food container. 4- The participating meals are received in the evening time each day between 5 and 7 PM as per the specified schedule. 5- The participant must submit a copy of his/her identification papers as well as the phone number. 6- The participant must not participate with more than one work in each meal, but can present three different meals. 7- First three winners will receive prizes in each type of popular meals presented in the contest. The UAE is famous for its variety of heritage and folk arts, among those is the Yowla, which is still performed in many social and national ceremonies and events. The Yowla is a form of folk art which is performed by one, two or four persons. It was developed by young men who used wooden weapons (not loaded) that simulate traditional real weapons. The performer moves the Yowla quickly and smoothly following a certain rhythm usually accompanied by drums and controls the weapon by throwing it into the air and spinning it fast before catching it again. It is worth mentioning here that this traditional form of art aims to showcase the strength and prestige which is why young boys would take every opportunity to learn how to perform Yowla. 1- The contestant must perform within the specified time of 3 minutes only. 2- The participants must adhere to the date and time of the contest. 3- The participant must submit a copy of his/her personal identification papers and the phone number. 4- First three winners will receive valuable prizes in their respective groups. Al Taghrooda is a form of traditional Bedouin sung poetry performed by men as they traverse the desert on the back of their camels to ease the difficulties of travel through the dunes and encourage their camels to move faster. This form of poetry is composed by specialized poets to be sung by one person or a group of persons. Usually this poetry consists of a short poem that follows ‘Rajaz’ metre and is improvised by travelers; other travelers repeat the verses after the main singer. Al Taghrooda discusses various themes such as romantic love, friendship, eulogy, tribal relationships among others. In our modern time, and due to the development in transport which limited the use of camels as a means of transport, Al Taghrooda is now being performed in many ceremonies, such as weddings and national celebrations and addresses various social themes. Due to the importance of Al Taghrooda in the Emirati heritage it was registered in the UNESCO on December 6th, 2012. 1- The participant must be a UAE national aged 15 years or older. 2- The participant must submit a copy of his/her personal identification papers and the phone number. 3- The participant must adhere to the time and date of the contest. 4- Al Taghrooda must be enthusiastic and should not contain more than 7 verses. 5- The participant must improvise Al Taghrooda in front of the arbitration committee. 6- First three winners will receive valuable prizes. Falconry, or ‘Al Qans’ (hunting) as it is locally known, is a very popular traditional sport in the United Arab Emirates and is among the key aspects of the Emirati and Gulf cultural and heritage identity. Emiratis have practiced falconry in the desert for many years and adopted it as a hobby and a source of food. Hunters would go out into the desert on foot or on camel backs carrying their supplies. Falconry is an integral part of an ancient human heritage that embodies the spiritual and moral relationship between man and bird. There is nothing that can truly express the status that falconry enjoys in the United Arab Emirates and its cultural importance than what the first falconer, the Late Sheikh Zayed Bin Sultan Al Nahyan once said: ‘Falconry is an important sport and a way to learn patience, strength and endurance. It is also a form of competition between men that require strength and intelligence, and shows Bedouins’ capabilities in taming and training this wild bird of prey to follow orders and answer to his master’. The United Arab Emirates is famous for its wide variety of traditional handicrafts and industries, most notably those related to palm tree fronds, natural fibers, Talli, spinning and weaving (especially the Sadou), pottery, ornaments and jewelry making, carpentry and leather industries. Local handicraft products are unique and reflect the local tastes which attract tourists and visitors which helps promote the country and introduce foreigners to the heritage and culture of the United Arab Emirates and the Arab gulf region. Therefore, Abu Dhabi Department of Culture and Tourism works on encouraging and supporting those handicrafts and industries to produce large quantities and promote their products locally and internationally as part of its pioneering project that aims to document and develop traditional handicrafts and industries in the Emirate of Abu Dhabi. Popular markets reflect a unique aspect of the Emirati society. These markets hide behind their walls a marvelous world of simplicity and beauty, tales of the past that are mixed with scents of Oud and incense that adds a magical touch to these places. Despite the diversity of modern luxurious shopping malls and centers, popular and traditional markets are still strongly present today and people continue to visit them regularly. Traditional goods and products always attract shoppers and families to buy perfumes, clothes and other stuff for their loved ones. Shopping in traditional and popular markets is always fun and it takes the visitors on a journey to the past as they walk through its old pathways and shops which maintained its traditional look over the years. The experience in these markets differs greatly from that found in other more modern markets. In line with the plan adopted by Abu Dhabi Department of Culture and Tourism which focuses on empowering students and educating them about their heritage, a number of educational and cultural workshops will be organized during the Festival days. The workshops target school students and aim to enhance their sense of belonging to the national identity and educate them about their heritage. It also seeks to raise awareness regarding the UAE heritage and the history of the country. Hospitality in the UAE is not only a value that is passed down from one generation to the other, but a lifestyle. Welcoming travelers and showing great hospitality has been the norm since many generations, and is now an integral part of the everyday interactions among the people from presenting Arabic coffee to the highest levels of modern service. Arabic coffee, dates, sweets and popular food will be provided in the Festival.